Using the nudgeable kit, I worked with Chai to come up with two concepts that we could build with the kit. Our first idea was a system built into the cuff of a sleeve that would let someone giving a speech be able to ask for a prompt from a spotter in the audience. By tapping the opposite sleeve, the speaker could trigger the buzzer in the spotter’s sleeve, letting them know that a prompt was needed. Or the spotter could trigger the speaker’s buzzer, letting them know that they’ve forgotten something. The second idea was a shawl that would help the wearer to alert a friend of a date that isn’t going well. The shawl is wired with the bulk of the wiring at the nape of the neck, with conductive fabric at the tails of it. When the wearer decides that she needs out of the date/conversation, she can casually wrap herself in her shawl, and trigger a friends nudgeable, allowing her to be helped out of the situation. 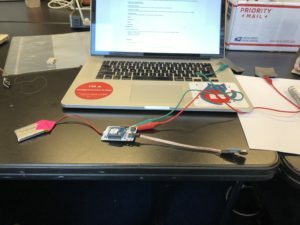 It was a fun experience that helped expand my ideas of what I could make for a wearable. They can be more than fitness trackers, smart watches, and other personal gadgets. 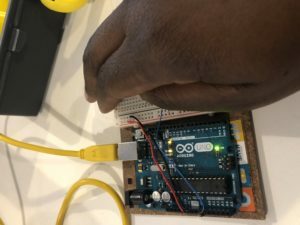 For my body language detector, I wanted to use my Arduino, and get back to the basics with building with my physical computing kit. I tend to fold in on my self, cross my body, and the like. So, I was curious if I could eventually create something that would quietly indicate when I’ve folded in on myself. 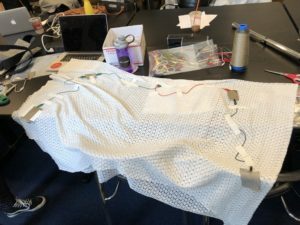 Instead of using something with conductive fabric, I wanted to play with light sensors, with the idea being that if a certain part of my body was in enough light, I’d get one signal. If I’ve crossed myself, and the diode isn’t getting enough light, I get a different signal, reminding me to open up, and not close off my body language. 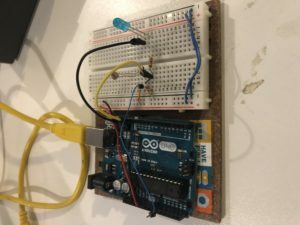 To test the idea, I set up my board with so that the led is on if it’s getting light, and it goes out if the light sensor isn’t getting light. I set up the light sensor first, making sure that I was getting readings from the light sensor. I then added the led, and the other necessary parts. I had a couple of issues with my setup, mostly due to minor oversights. Untitled from Kellee Massey on Vimeo.